Definition at line 946 of file RegionInfo.h. Definition at line 119 of file RegionInfo.cpp. References llvm::PassRegistry::getPassRegistry(), llvm::initializeRegionInfoPassPass(), and ~RegionInfoPass(). Definition at line 156 of file RegionInfo.cpp. 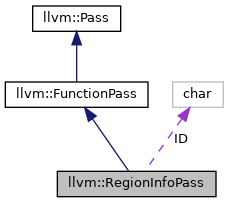 References llvm::RegionInfoBase< Tr >::dump(), ID, INITIALIZE_PASS_BEGIN(), and INITIALIZE_PASS_DEPENDENCY. Definition at line 144 of file RegionInfo.cpp. Definition at line 955 of file RegionInfo.h. Referenced by llvm::DOTGraphTraits< RegionInfo * >::addCustomGraphFeatures(), llvm::GraphTraits< RegionInfoPass * >::getEntryNode(), llvm::GraphTraits< RegionInfoPass * >::nodes_begin(), and llvm::GraphTraits< RegionInfoPass * >::nodes_end(). Definition at line 957 of file RegionInfo.h. References llvm::dump(), F(), print(), and runOnFunction(). 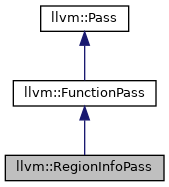 Definition at line 151 of file RegionInfo.cpp. Definition at line 136 of file RegionInfo.cpp. Definition at line 125 of file RegionInfo.cpp. Definition at line 140 of file RegionInfo.cpp. Definition at line 950 of file RegionInfo.h.